A guide to Kythnos - a Cycladic island less than 2 hours from Athens and which offers plenty of charm, great beaches, wonderful hikes and more. I love the relief of Kythnos, the bare, sun-baked slopes of its low hills, the play of the afternoon light on them as you travel along the main road along the island’s backbone. Despite its bare appearance at first glance, Kythnos hides many different sights when you better get to know it: scattered chapels, two central villages (Hora – aka Messaria – and Dryopida), caves, the ruins of ancient temples and medieval castles, the hydrotherapy facility built in 1840, the iron bridges of the old mines, and small oases of green near the coasts and wherever there are ravines such as in Mathia with its old washhouse. All of these things tell Kythnos’ story in their own way; meanwhile as a tourism destination it is growing ever more sophisticated. It always maintains a simplicity and a sense of easy familiarity. It is accessible in every sense, with boats arriving daily from the ports of Lavrio and Piraeus. 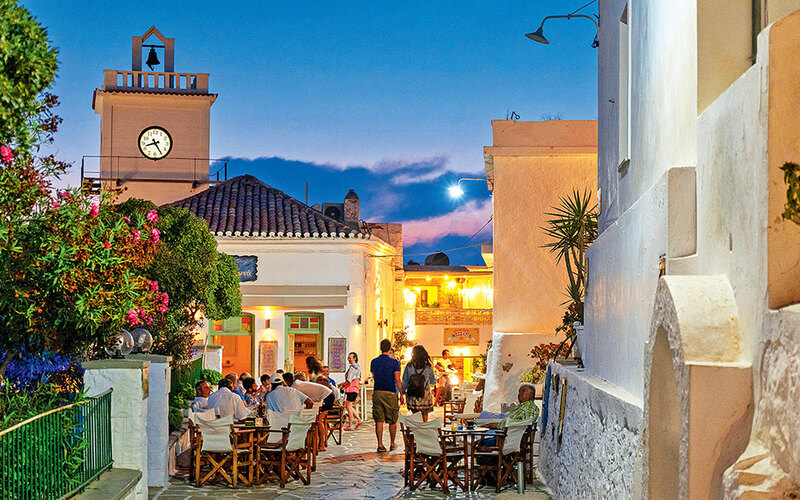 At the end of August it was filled with people – mainly Greeks – who due to the economic crisis have turned to nearer and more budget-friendly islands. I meet old friends from my student days, acquaintances and locals. The mechanical engineer and contractor Stamatis Martinos talks about the “carefreeness together with the relaxation and comfort that Kythnos offers. In contrast with other Cycladic islands that are very glossy, here the logic is to have an attractive aesthetic and high quality, but without needing to make everything complicated.” The houses that he builds together with his father Yiannis draw elements from the kelia, the old simple agricultural dwellings that one still finds scattered across the island. Today on Kythnos you can find everything: traditional local flavors such as the sfougata (croquettes made with fresh local cheese curds), tarachta (a dish made with eggs and tomatoes), as well as fresh takes on classic Greek flavors, such as the experimentations of chef Alexandros Angelis at the restaurant Chartino Karavi in Dryopida. You can pair your meal with locally produced un-bottled wine or a bottle of Assyrtiko Dryopas from island’s Estate Gonidakis. Several shops sell interesting clothes and accessories, such as Mavro Provato in the port, Aneme in Aghia Eirini and Passou in Hora. You will sip cocktails at the beach bar Hamsa in Martinakia, or at Kraken, which has quickened the pulse of the nightlife in Hora. And you can purchase handmade soaps and creams made from pure, locally sourced raw ingredients at Cat with Hat. Hora, aka Messaria is a classic Cycladic village, filled with whitewashed churches and alleys decorated by flowers and other elements, some with painted walls, such as the home of Miss Flora, or with windows surrounded by colorful garlands. 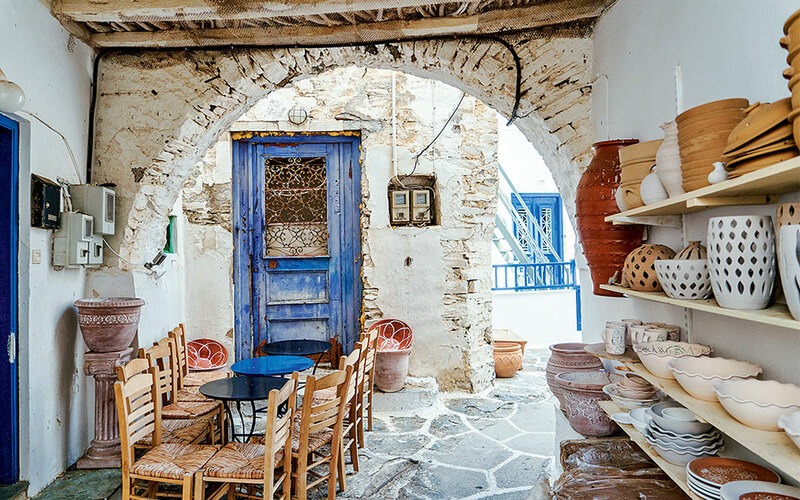 Walking here you will pass under covered passageways and by houses featuring the unparalleled plasticity of Cycladic architecture and painted blue windows. 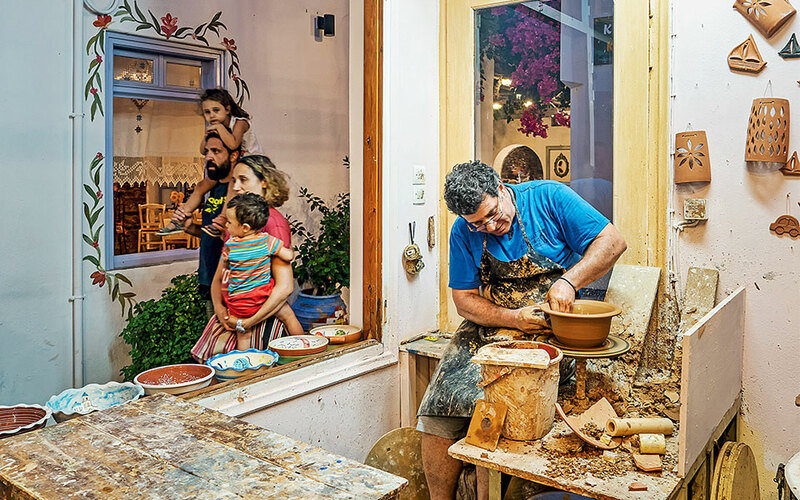 Here on a central alley that bustles with life, one also finds the shop of the only active ceramicists left on the island: Giorgos Georgoulis and his son Giannis. Pottery making and ceramics blossomed on Kythnos from the mid 19th to late 20th century. 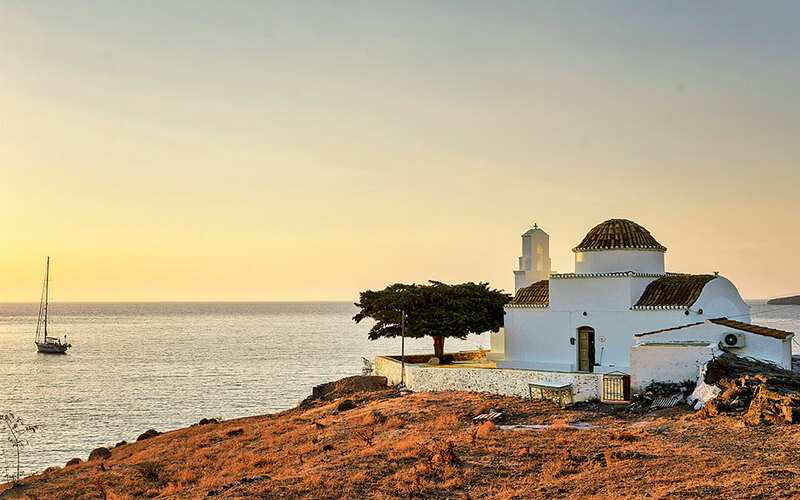 The craft was brought to the island from Sifnos by passing locals of that island hailing from areas such as Sifnos’ coast which is rich in high quality clay. 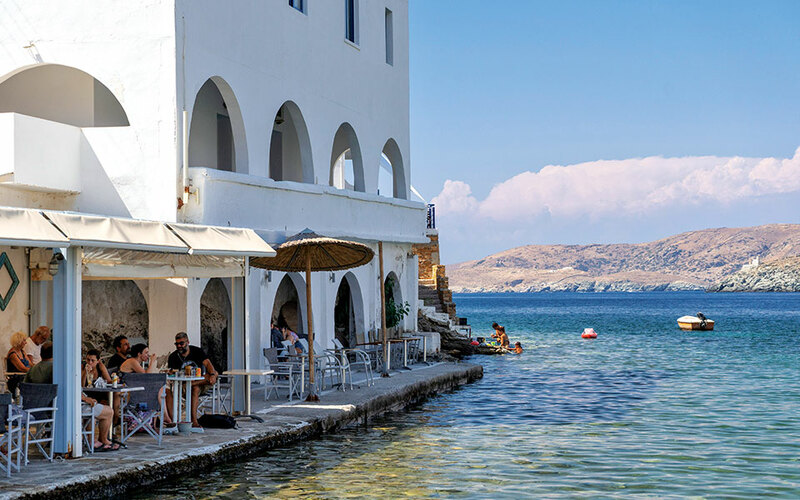 Three years after my first visit to the island, I find Hora and all of Kythnos subtly revitalized; the island still maintains its laid-back character while offering something more. Just such a something is a cocktail at the brand new The Kraken (tel. (+30) 22810.317.79), atmospheric and ideal for parents. Behind the outdoor bar is an enclosed play area – a great place for visitors to let their kids blow off some steam while they sip a refreshing concoction. On the other side, cushions are laid out on the sloping steps of the church. This is fitting as Kythnos has always has a pew for all, even those who have had a glass too many, boasting a church known as Christos ton Methismenon (Christ of the Drunken). At this little church, the residents of Hora, a little tipsy, gather to celebrate on the day after Christmas, after having celebrated the day itself at the larger Church of Christ. At every church and chapel across the island, you will always find a candle burning. Every walk in Hora is filled with tempting stops, such as the pastry shop Tratamento (tel. (+30) 22810.316.38) for a galaktoboureko (custard filled pastry) fresh out of the oven. For a full meal one can choose among tavernas offering traditional local fare, such as To Steki tou Ntetzi (tel. (+30) 22810.312.04) and Messaria (tel. (+30) 22810.316.20), or a restaurant offering more modern Greek and European cuisine such as Psipsinas (tel. (+30) 22810.312.28) where the emphasis is on seafood. “Annousio… Annousiooo!) At the third call from her friend, Anna Gonidis emerges smiling into the courtyard of her home to welcome us. “One minute, I just made pasteli.” A divine, still-warm pasteli (sesame snap) with almonds in the middle. Almonds, figs, olives and pears are among the agricultural products cultivated on the island in small amounts. Honey too – that used in the pasteli we are enjoying was produced by Anna’s son, Dimitris Gonidis, whose brand, Pure Mother Bee has won a total of 9 awards chiefly from international organizations such as Great Taste and Biomiel. “Sylakas [today’s Dryopida] was the agricultural village of Kythnos,” we are reminded by our guide for this excursion, the lawyer Marieta Georgouli, a member of the very active Syndesmos Dryopideon Kythnou (Association of Dryopidans of Kythnos) and the soul of the Folk Museum (open daily 10.00-14.00 and 19.00-21.00). 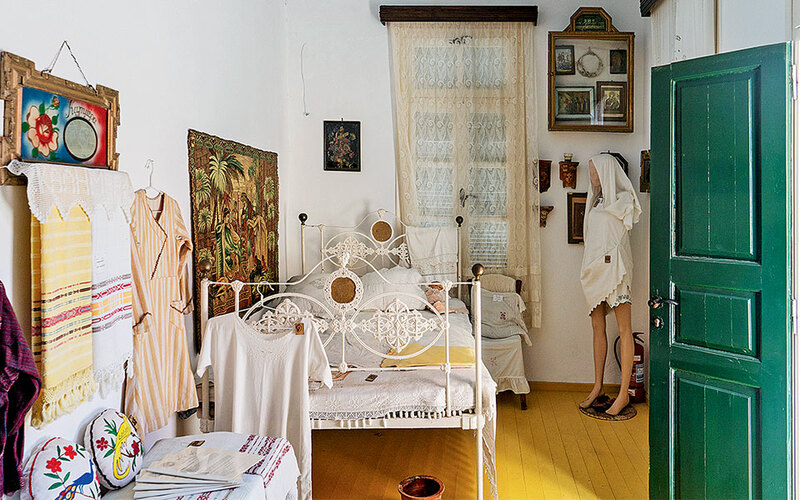 The latter is a fully furnished traditional home with household items, old black and white photographs, maps, engravings, agricultural garments etc. The Folk Museum of Kythnos in Dryopida. It is said that the Dryopes were among the first residents of the island. They gave their name to Dryopida, which may have signs of dereliction in places but maintains a charm that flows from its deep history and from the bowels of the earth. I am referring to the cave of Katafyki. The coolness of its interior offers a refreshing break from the heat of midday summer walks along the settlement’s lanes. The residents of Dryopida did not need to build a castle during the years of pirate raids – their refuge was always the cave located on the edge of the village. The locals have used it over the centuries as a shelter, as a ‘fridge’ for their food, and even as a celebration hall for Easter and May 1st. They would gather in the so-called Megali Piatsa (Great Square), one of the spacious chambers of the cave. Extending into the earth are other natural chambers lined with small white stalactites, as well as man-made tunnels – the latter evidence of the ore mine that once operated here. 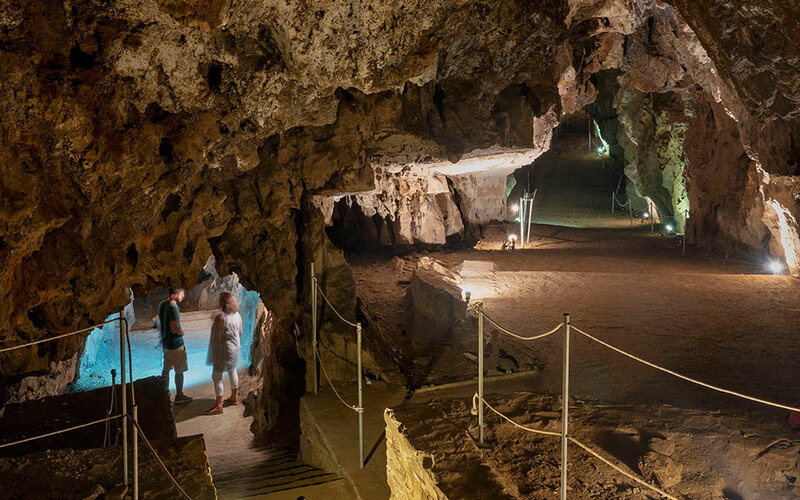 In a chamber where natural stalactites and stalagmites are still intact you will see natural sculptures given names after their shapes such as the “embryo”, the “teddy bear” and the “medusa / octopus”. A standout is Chartino Karavi (Paper Boat – tel. 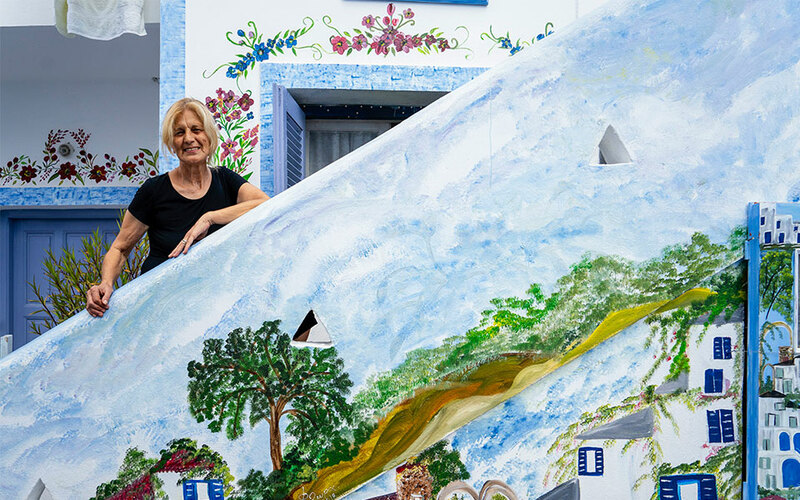 (+30) 22810.330.04), the ‘art restaurant’ of chef Alexandros Angelis which applies modern cooking techniques to Greek cuisine to create dishes such as goat with a sauce of pine nut and crystals of Chios mastic. Try local flavors at the grill house O Stamatis (tel. (+30) 22810.326.67), casseroles and slow cooked dishes at the traditional eatery I Pelegra (tel. (+30) 22810.323.22, 6944.576.413) and desserts at Kythnon Anthoessan (tel. (+30) 22810.321.45). 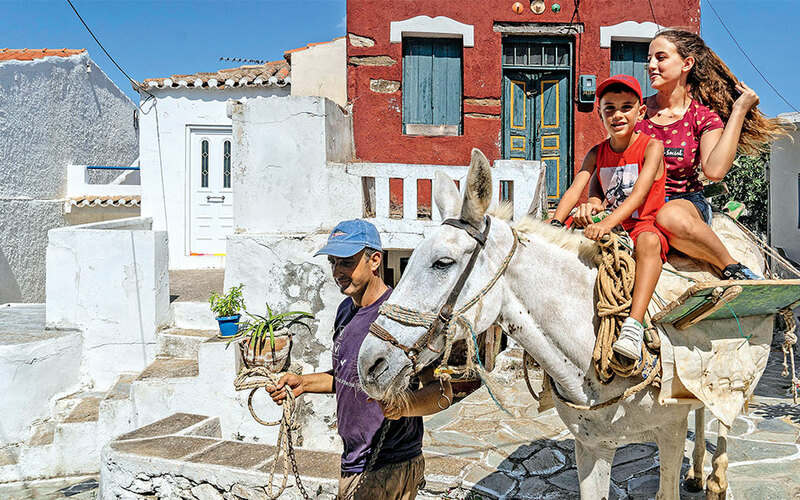 Wandering through the labyrinthine alleys of Dryopida with guide Giorgos Vadivoulis we discuss its past agricultural economy and at the same time cross paths with a white mule that goes by the name of Konstantinos and is transporting the children of the family who care for it. We pause at points where three alleys meet and learn how the maze-like layout of the settlement was another form of protection against pirates. With only rudimentary tourism infrastructure, Dryopida’s only accommodation options are rooms to let, while its first hotel is currently under construction. Of the seaside villages, Merihas, the port of Kythnos, by default is the busiest. Here you’ll find fish tavernas with tables on the shore, a few shops for basic supplies and the most organized beaches on the island. Martinakia, to the right of the port, has been upgraded this year with soft seats and wooden sun beds on the sand, and music and cool cocktails from the new beach bar restaurant Hamsa (tel. (+30) 22810.329.51). Further out are the beaches of Episkopi and Apokrousi, while tourist boats regularly depart Merihas for the renowned beach of Kolona. This much photographed sand bar with sea on both sides also attracts many yachts and has a seafood restaurant nearby. It is also accessible by land, along a passable dirt road, as is the case with many of Kythnos’ beaches. Loutra was the first of Kythnos’ settlements to be developed touristically thanks to the 19th century hydrotherapy facility of “Otto and Amalia” as it is known to many. The royal couple tasked the construction of the baths which made use of the area’s natural thermal waters, and its neighboring guesthouse to the German architect Christian Hansen. The marble baths still operate and, together with the now-derelict guesthouse, have been declared a Historic Monument by the Ministry of Culture. 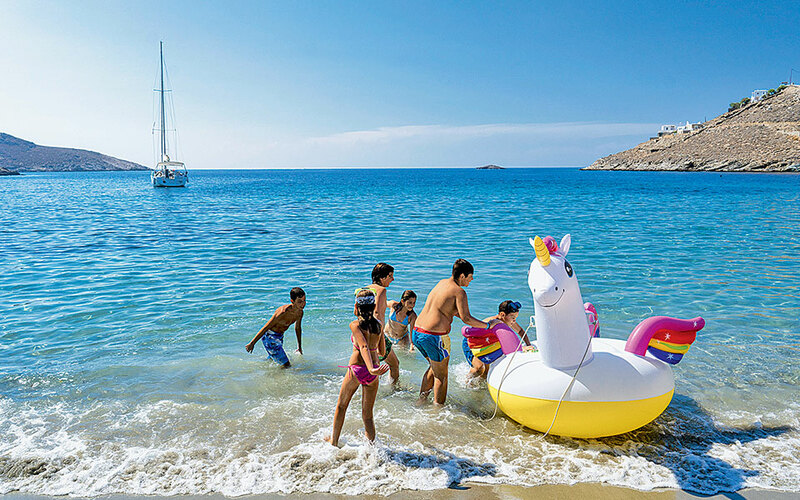 A recent tender for the renovation and operation of the facilities was declared void, but one feels that the quest to find a new investor is one which could ultimately lead to a new era of health tourism for Kythnos. Other tourism infrastructure in Loutra are a high quality scuba diving school, Aquateam Dive Center (tel. (+30) 22810.313.33), as well as rooms to let, seafood tavernas and cafes with tables by the sea and a small harbor where you’ll see fishing boats as well as yachts and other pleasure craft. A popular stop for recreational sailors, you will also see a number of boats anchored out in the adjacent deep bay of Aghia Eirini. Comprising 30 caiques, Kythnos’ fishing fleet is considered one of the largest in the western Cyclades and supplies fish to Kythnos, Kea and Serifos. Swordfish and red mullet are among the fish regularly caught, which you will find in the fish tavernas. Continuing north, a great beach for swimming is Aghios Sostis, as is Potamia, although the dirt road leading to the latter is quite rough and best tackled by a 4×4. Towards the south the settlement of Kanala is built on a low hill around the church of Panaghia Kanalas in an area with a few pines providing a different view of Kythnos. Many of the country homes and rooms to let here feature architectural styles from yesteryear. At the same time, new buildings are sprouting up offering incredible views. It is clear that there is a pressing need for the older buildings to be renovated in order for Kanala as a whole to be upgraded. 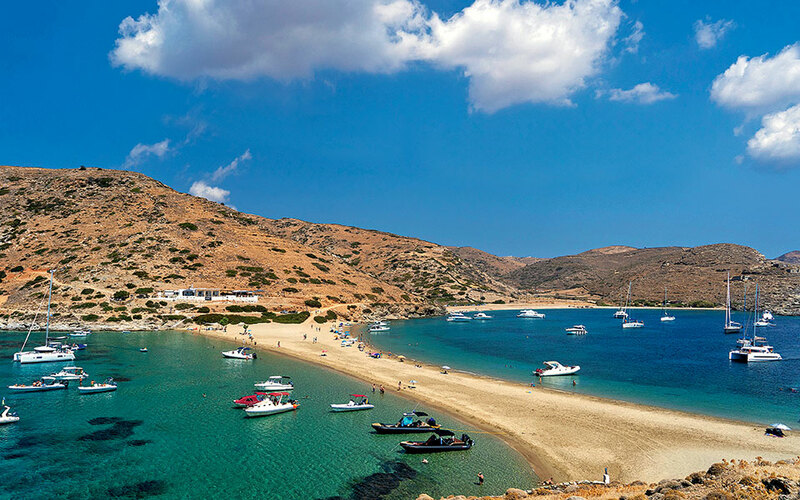 Continuing even further south, the more rugged side of Kythnos is revealed, together with its beaches which feature a virgin, and often wild beauty, such as Gaidouromandra, Simousi and Skylos. The landscape becomes gentler at Aghios Dimitrios in the southwest with sea daffodils, a few hammocks strung up between tamarisk trees, two tavernas and scattered rooms to rent and country homes on the slope behind it. In Kastella we encounter a group of French people doing yoga. It is a glimpse of Kythnos’ new touristic profile which is incorporating new trends thanks to the initiative of a few enterprises such as K4 Kythnos. And it once again triggers thoughts about how the hydrotherapy center could be put to use and significantly raise Kythnos’ profile in the sector of health and wellness tourism. 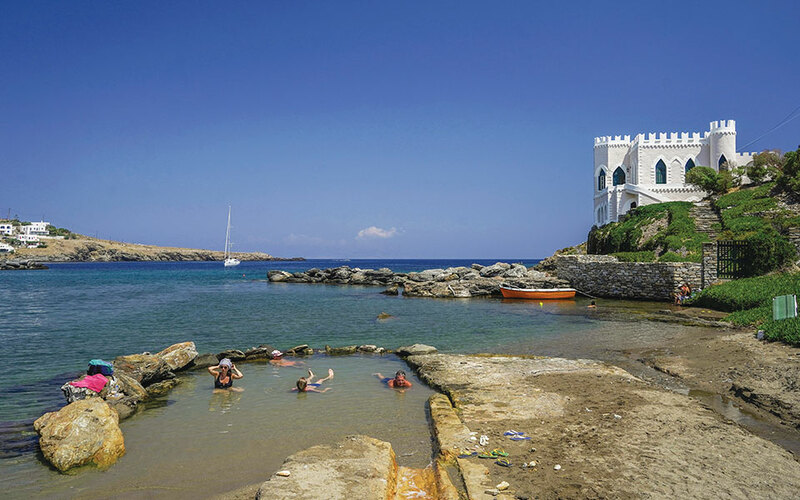 The church of Panaghia Flambouriani is a key point of reference on the island to watch the sunset and around the neighboring beach are a number of rooms to rent with basic amenities and low prices. The traditional festival which takes place every August 22nd here is just one of many held on the island. The Kythniots never miss an opportunity for a celebration and traditional dancing. The custom on the island is for people to always dance in pairs even in the dances where everyone links arms to form a large circle, and one gets the impression that their festivals are a vital part of rejuvenating relationships and promoting social cohesion. For lobster salad and other seafood dishes book a table at the restaurant Arias (tel. (+30) 22810.313.71) in Aghia Eirini. 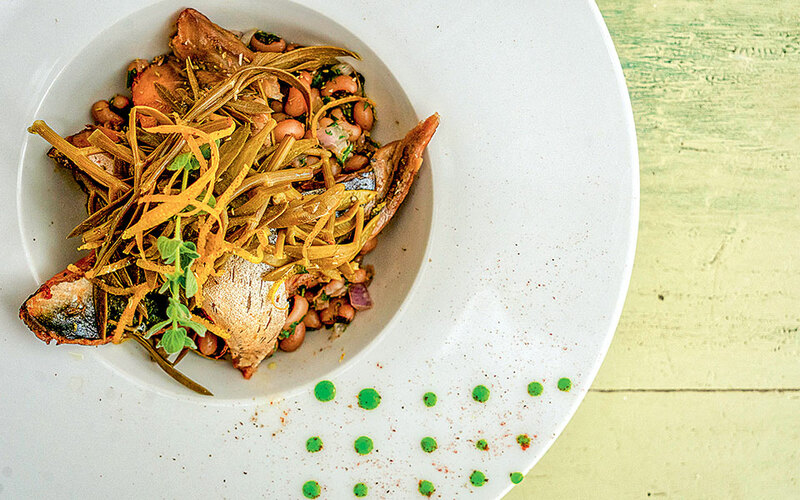 For fresh fish and many other dishes also try Ostria in Merihas. The taverna Archipelagos in Kanala (tel. (+30) 22810.323.80) is famed for its good Greek food. Also good for local specialities is Mila (tel. (+30) 6945.8258.13) in Aghios Dimitrios. 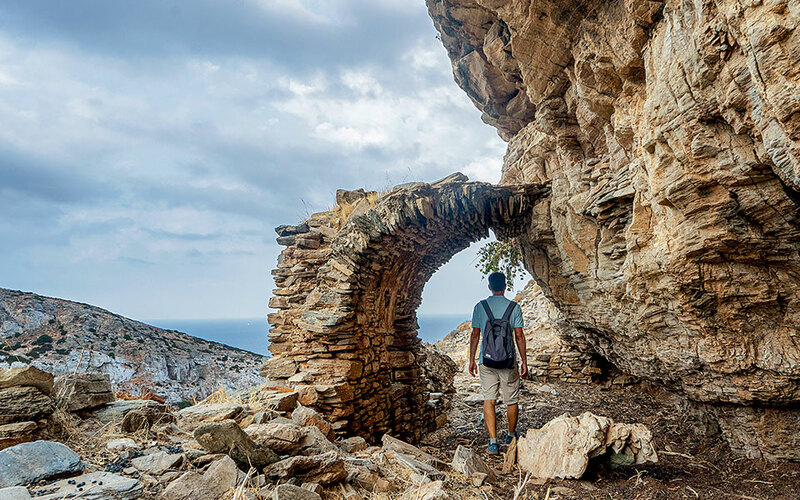 Kythnos has many interesting spots for hikers and the Municipality of Kythnos has plans to promote the island’s trails, however the signage is still poor so the best option for those interested in hiking is to arrange to go with a guide. It is worth visiting the Castle of Oria in the north, the archaeological site of Vryokastro where one can see the ruins of temples dedicated to Demeter, Aphrodite, and Artemis and Apollo while also enjoying great views of the beach of Kolona. Another interesting site is Tourkala with its small lake next to the old mining facilities. For organized hikking tours contact Giorgos Vadivoulis, (tel. (+30) 6979.118.996, www.experiencekythnos.gr) or Kythnos Hiking (www.kythnoshiking.com). Kythnos is serviced by boats daily from the port of Lavrio (travel time 1 hr 40 min, singles cost €15.90) and from Piraeus (travel time 3 hr, singles cost €25). Κ4 Κythnos (tel. (+30) 6972.858.493). Villas for rent in Kastella, Kanala and Miloi, some are in organized clusters with a common restaurant, pool and other amenities while others are independent. 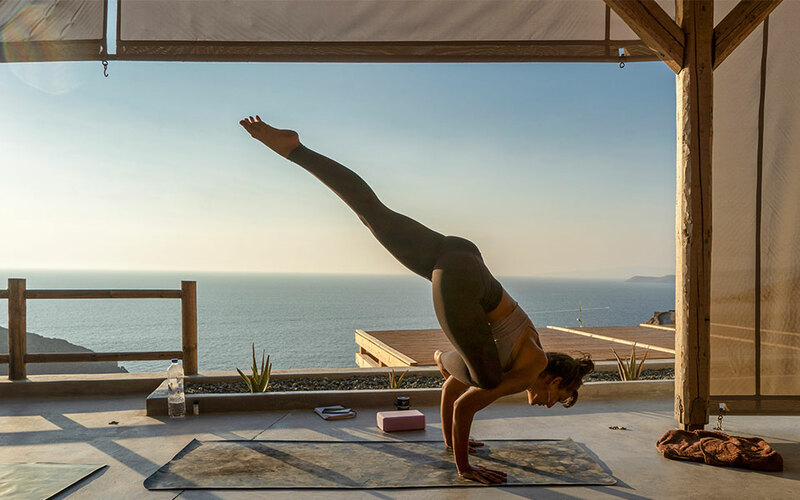 Yoga lessons and wellness services including various types of massages can be arranged as well as other activities such as photography lessons. For more information contact Nikos Kontogiannis. From €125 for a house that sleeps 3. Hotel Messaria (tel. (+30) 22810.316.72). Fully equipped apartments with classic furnishings at the entrance of Hora. From €80 for a double with breakfast. Villa Beleza (tel. (+30) 22810.321.84). Independent, comfortable apartments in Martinakia, 200m from the sea. From €60. Kontetsa Guesthouse (tel. (+30) 22810.330.24) in Merichas with a light and airy aesthetic and friendly atmosphere, some rooms have sea views. From €60 for a double room with breakfast. On Kythnos you will find many other good options and rooms to let in many locations with prices starting at €30. 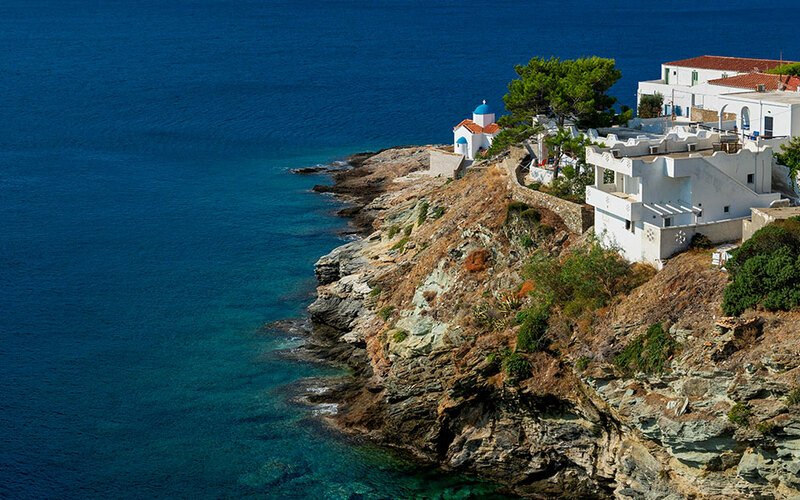 Which Greek Destination is Best for You?